There are a handful of DJs and Producers in the world who have truly seen and done it all when it comes to the early beginnings of raves, and what has now grown into the massive global movement of electronic dance music. 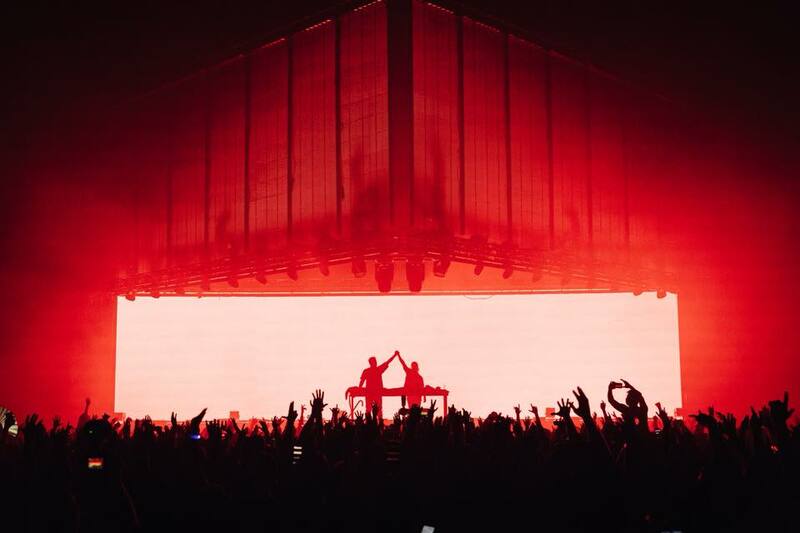 Swedish production duo Axwell Λ Ingrosso are two of those artists, and this past weekend we caught their champion performance at Chicago’s PRYSM Nightclub. Both Axwell and Sebastian Ingrosso have been taking over the world of electronic music for well over a decade. Filling up the years with worldwide tours, club stages spanning countless countries, and headlining dozens of top music festivals across the globe, the pair are simply irresistible by sound and presence. Their music will forever remain staple songs of EDM, their live performances will continue to go down in history, and together, Axwell Λ Ingrosso make up an incredible amount of the heart and soul that electronic music thrives from. PRYSM’s opener slayed his intro set, throwing down classics like Empire Of The Sun’s “Alive,” Galantis’ “No Money,” both of Tiësto’s “Secrets” and “Carry You Home,” and The Chainsmokers epic team up with Coldplay for “Something Just Like This.” Everyone inside the club went all out for the streak of tracks by Avicii, including “Hey Brother,” “Levels,” and “Fade Into Darkness.” Towards the end of his set he mixed in Afrojack’s recent thunderous single “One More Day” which rallied up the crowd in sweet vibrations, all gearing up for the headliners ahead. There’s nothing like the first moment when the DJ steps out into the booth, with hundreds of screaming fans simply electrifying the night. Upping the ante of this truly magical feeling was none other than Axwell Λ Ingrosso, two of dance music’s most acclaimed and beloved artists. It was instantaneous energy turned up to the max when the duo opened with their high powered record “How Do You Feel Right Now” alongside beastly drum percussions to top off their intro. Wasting no time, they dove into one anthem after another. “Dream Bigger” was accompanied by bold visuals behind the booth that projected the title in neon letters, shortly followed by their iconic version of Sebastian Ingrosso and Alesso’s mecca track “Calling (Lose My Mind),” this time around mixed in with “Apologize” by OneRepublic. If there’s one recent release by Axwell Λ Ingrosso that gets the crowd going like none other, it’s “More Than You Know,” and Chicago was no exception. A blend of the song’s music video up on the screen, bright white lights, neon screens, and a massive burst of confetti, this one set the night off into pure bliss. Fans caught even more feels with “Dancing Alone,” “Something New,” and “Dark River,” while classic dance bangers like Daft Punk’s “One More Time” and Avicii’s “Levels” shook the walls from start to finish. The energy level shot entirely through the roof when Axwell Λ Ingrosso weaved in numerous songs by the legends themselves, Swedish House Mafia. Making up two thirds of the group, the crowd could hardly handle the hype of “Antidote,” “Save The World,” “One,” and last but not least, the anthem of all anthems “Don’t You Worry Child.” There is something about these songs that makes everything about dance music fall into place – living in the moment, experiencing the beautiful here and now of life, and uniting with people from all over the world in perfect harmony. Closing out with one of the most feel-good songs out there, “Sun Is Shining” warmed up everyone’s hearts and soared the evening out with a little slice of euphoria. With lasers, lights, sound, and energy all in perfect synch, it was a night of pure dance music heaven and another reminder as to why these guys have remained two of the most unstoppable, powerhouse icon producers in the game. As several fans in the crowd waved Swedish flags up high all night, Axwell Λ Ingrosso exceeded expectations yet again with a 10/10 performance, creating an unforgettable night of memories that will last a lifetime.